Lennie Mahler | The Salt Lake Tribune BYU's Erik Mika pulls in a rebound over Utah State's Jordan Stone and Spencer Butterfield in the second half of their game at EnergySolutions Arena in Salt Lake City, Saturday, Nov. 30, 2013. Lennie Mahler | The Salt Lake Tribune BYU's Erik Mika corrals a rebound over Utah State's Jarred Shaw in the second half of their game at EnergySolutions Arena in Salt Lake City, Saturday, Nov. 30, 2013. Lennie Mahler | The Salt Lake Tribune BYU's Erik Mika and Nate Austin celebrate Mika's bucket in front of the Utah State student section in the first half of their game at EnergySolutions Arena in Salt Lake City, Saturday, Nov. 30, 2013. 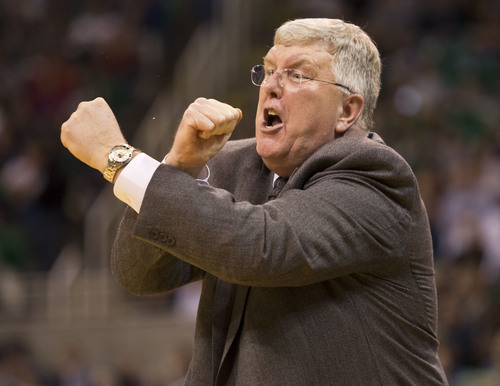 Lennie Mahler | The Salt Lake Tribune Utah State head coach Stew Morrill argues a foul call with a referee during the team's game against BYU at EnergySolutions Arena in Salt Lake City, Saturday, Nov. 30, 2013. 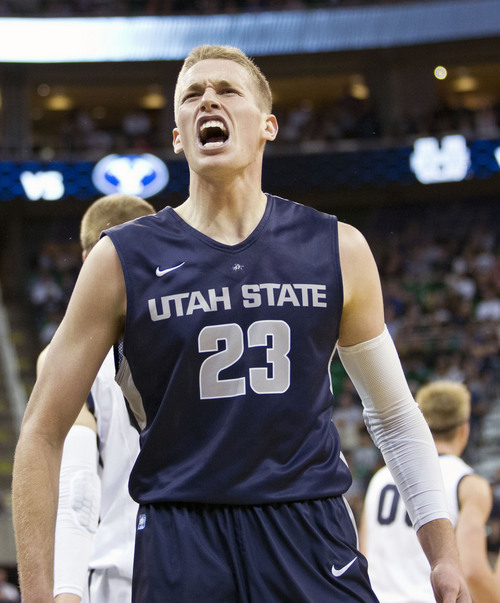 Lennie Mahler | The Salt Lake Tribune Utah State's Preston Medlin celebrates after scoring three points against BYU in the first half of their game at EnergySolutions Arena in Salt Lake City, Saturday, Nov. 30, 2013. Lennie Mahler | The Salt Lake Tribune BYU head coach Dave Rose watches the team on offense against Utah State at EnergySolutions Arena in Salt Lake City, Saturday, Nov. 30, 2013. Lennie Mahler | The Salt Lake Tribune BYU's Erik Mika shoots over Utah State's Jarred Shaw in the second half of their game at EnergySolutions Arena in Salt Lake City, Saturday, Nov. 30, 2013. Lennie Mahler | The Salt Lake Tribune BYU's Erik Mika draws a foul from Utah State's Jalen Moore as Jarred Shaw helps on defense in the second half of their game at EnergySolutions Arena in Salt Lake City, Saturday, Nov. 30, 2013. Lennie Mahler | The Salt Lake Tribune BYU's Kyle Collinsworth scores a bucket over Utah State's Kyle Davis in the first half of their game at EnergySolutions Arena in Salt Lake City, Saturday, Nov. 30, 2013. 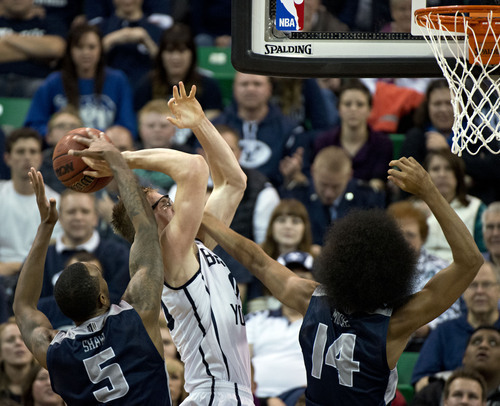 Lennie Mahler | The Salt Lake Tribune BYU's Matt Carlino shoots over Utah State's Jordan Stone in the first half of their game at EnergySolutions Arena in Salt Lake City, Saturday, Nov. 30, 2013. 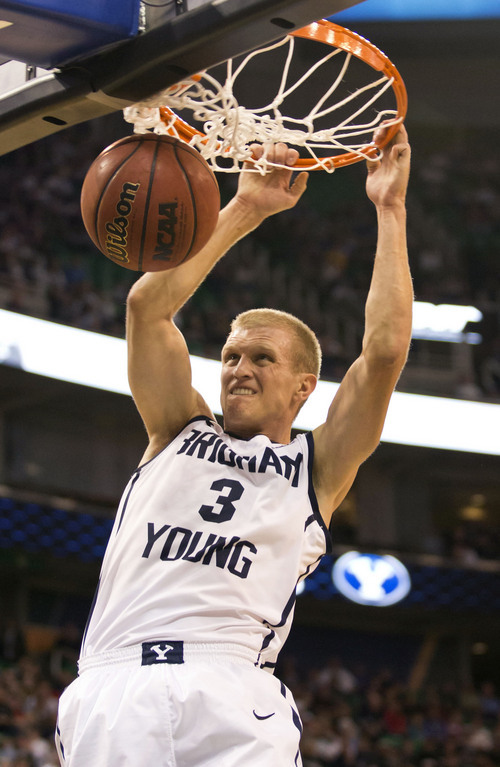 Lennie Mahler | The Salt Lake Tribune BYU's Tyler Haws dunks the ball in the first half of a game against Utah State at EnergySolutions Arena in Salt Lake City, Saturday, Nov. 30, 2013. Lennie Mahler | The Salt Lake Tribune BYU's Frank Bartley IV scores over Utah State's Ben Clifford in the first half of their game at EnergySolutions Arena in Salt Lake City, Saturday, Nov. 30, 2013. 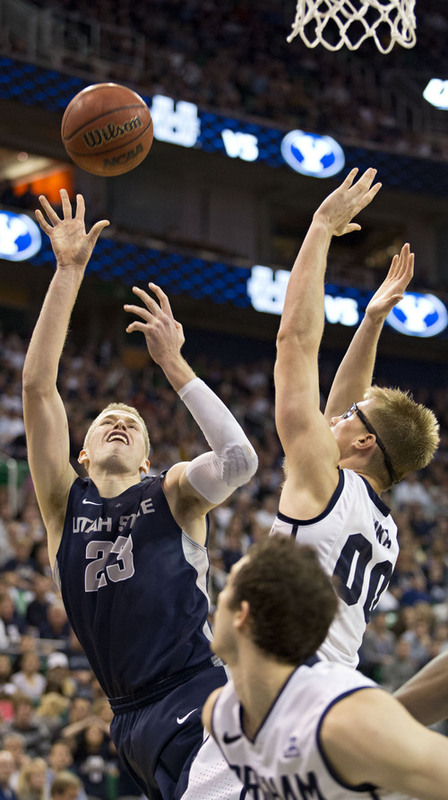 Lennie Mahler | The Salt Lake Tribune Utah State's Kyle Davis shoots over BYU's Eric Mika in the second half of their game at EnergySolutions Arena in Salt Lake City, Saturday, Nov. 30, 2013. 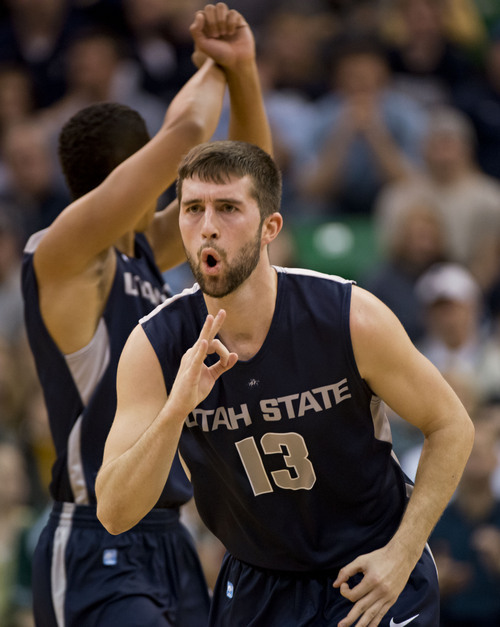 Lennie Mahler | The Salt Lake Tribune Utah State's Kyle Davis celebrates his bucket in the second half of a game against BYU at EnergySolutions Arena in Salt Lake City, Saturday, Nov. 30, 2013. The team that came into halftime with the lead never came out of the locker room. 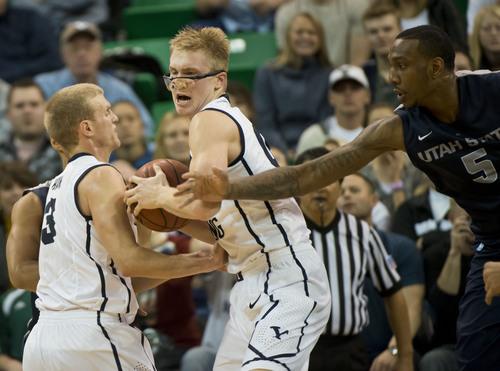 At least, that&apos;s how it seemed as Utah State struggled in the second half against BYU Saturday night. Where was the team that had made so many shots? That had outrebounded the Cougars early? That had passed the ball so efficiently? Coach Stew Morrill wasn&apos;t sure. 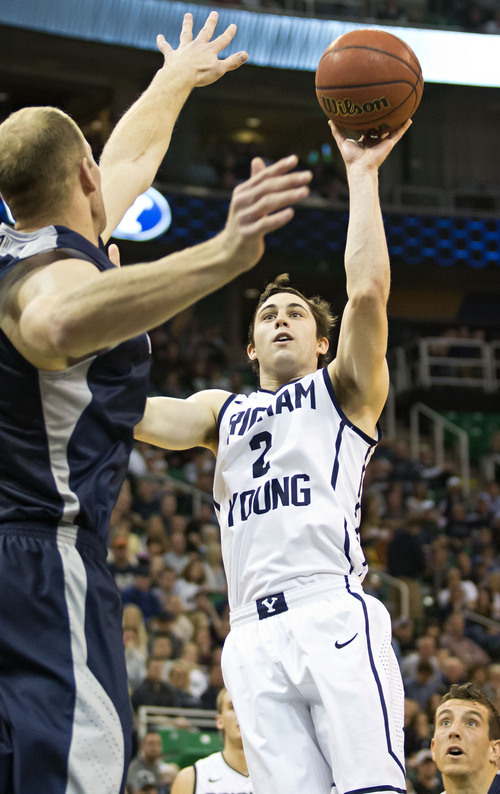 All he knew was that BYU laid out the Aggies in the second half of a 85-74 loss. "Give them all the credit in the world," he said. "They were the aggressors, driving the ball to the basket. We couldn&apos;t get them stopped. We missed a lot of open shots in the second half. They were more physical than us, they were just better than us." The numbers tell a startling story in Utah State&apos;s (5-1) first loss of the year. After shooting 59.4 percent from the field with 15 assists in the first half, the Aggies shot only 35.3 percent with four assists in the second. 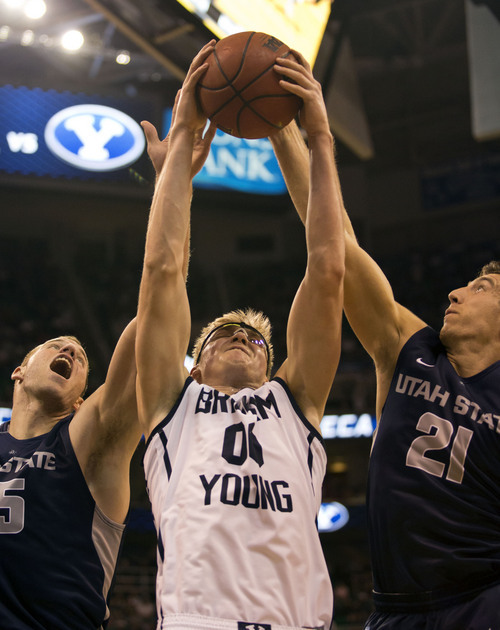 BYU turned the ball over only twice in the second half, while the Aggies lost the ball nine times. And the Cougars had a whopping 28 points in the paint in the second half while the Aggies had 14. But it wasn&apos;t necessary to see the stats to understand BYU took over. Utah State&apos;s missed shots didn&apos;t allow them to get in a zone that had been effective early, and the Cougars simply drove on to the hoop over and over. The Aggies couldn&apos;t stop them. "They were just driving by us," said Spencer Butterfield, who had 20 points and seven rebounds. "Our defense wasn&apos;t very strong. We need to guard the ball a little bit better. They were taking advantage of that." The Aggies said afterward that fatigue was not an issue in the team&apos;s third game in eight days. But something was lacking from the second-half performance. 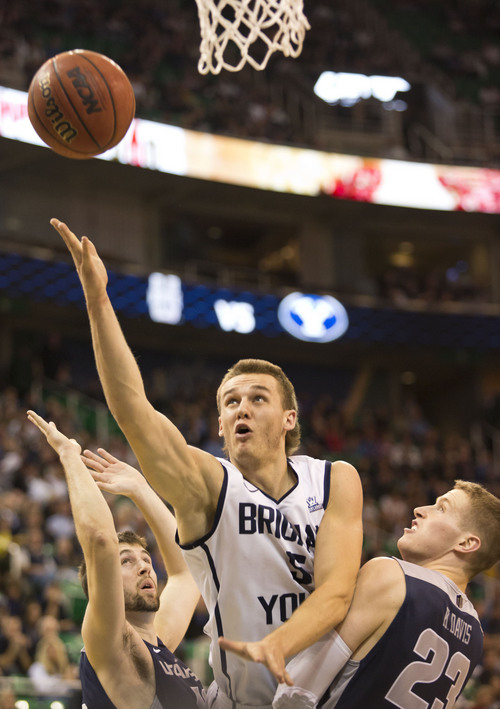 A 44-39 lead quickly evaporated as Matt Carlino and Frank Bartley penetrated into the lane and Eric Mika and Kyle Collinsworth scrambled for rebounds. Setting up offense was more of a struggle in the second half for the Aggies, who lost a bit of coordination. 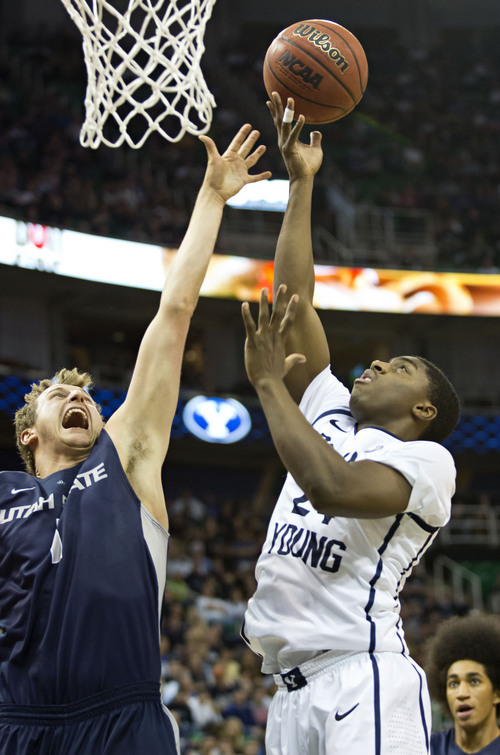 Utah State also never beat BYU down the floor, ceding 20 fast break points while getting none. The Aggies schedule will be home-friendly for the rest of the non-conference schedule. 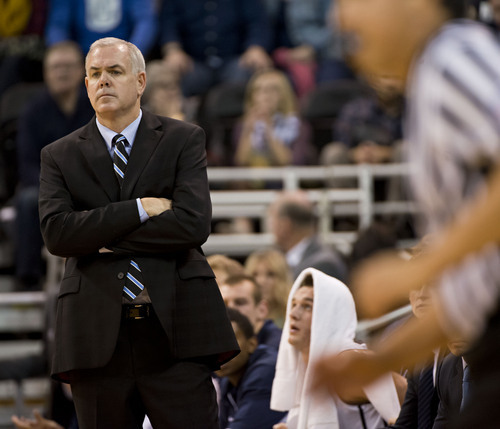 Morrill hoped it would give Utah State a chance to improve for Mountain West play. "We&apos;re going to have to get better, and it&apos;s early in the year," he said. 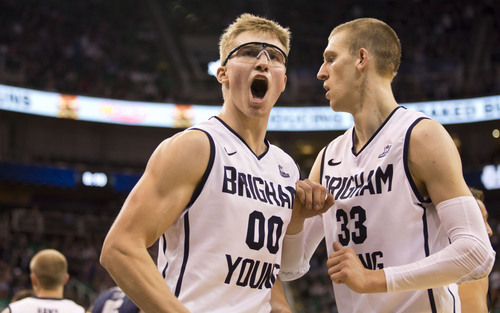 "BYU&apos;s got a really good basketball team. If we can get to where we can defend a little better, we&apos;ll have a nice team."